Was $1,189.98 Shop now and save! Say hello to pure comfort with this soft, velvety fabric. Other Dimensions: Arm Height: 25.5 inches. Floor Clearance: 6 inches. Seat Height: 19.5 inches. Product Description Velvet Splendor. Fall in love with velour as the comfort of the Bryden collection in beige takes you on a journey to serenity and contentment. This contemporary design features soft, textured and velvet-like beige fabric wrapped around plush cushions that add to a room’s warmth. Deep seating provides ample space to maximize comfort, while elegantly tapered wood feet add sophistication. 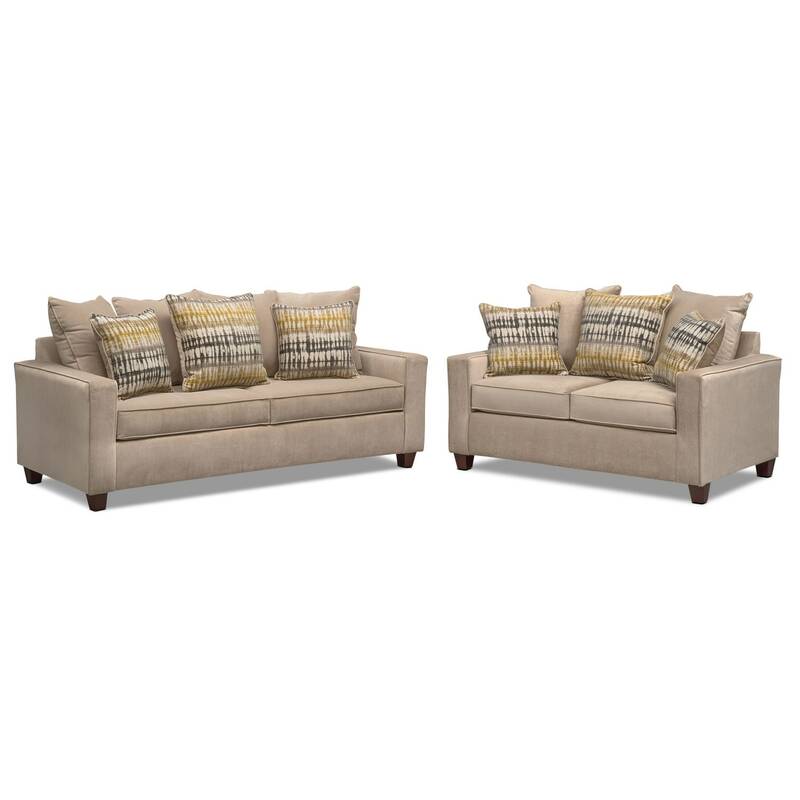 Two-piece package include Queen innerspring sleeper sofa and loveseat, as shown. Unique Features: Beige velvet-like fabric blends easily with any room’s color scheme. Welted track arms with deep seating maximize comfort. Cozy innerspring coils provide the ultimate in mattress comfort. Abstract accent pillows add an artistic component to this contemporary piece. Construction: Constructed of hardwood and plywood solids for rugged strength and durability. Pillows: Sleeper sofa includes two patterned toss pillows, one large accent pillow, and four large back pillows. Loveseat includes two patterned toss pillows, one large accent pillow, and two large back pillows.